I’m privileged enough to live along a picturesque canal and as an added bonus there are some great trails that run the length of it. A couple of good friends and I take frequent advantage of those trails to pull the ATV’s out of storage and step on the gas. For the most part these trails fairly well cleared, but every once in a while we’ll come across a fallen branch that’s awkwardly placed across our path and we have to look for an alternative way around. While it’s not really practical to carry a chainsaw around on an ATV, the thought has crossed my mind once or twice. An alternative to a chainsaw is something called a pole saw and one of these would definitely come in handy when faced with one of those fallen branches. The Remington RM1025SPS Chainsaw/Pole Saw Combo is a good example and while it’s ideal for reaching those hard to reach branches, it can be used for any small cutting job. The Remington RM1025SPS is an innovative product that’s essentially two tools in one. You can use it as a traditional chainsaw, or you can attach a pole to it and use it for reaching branches that are several feet above your head. It eliminates the need for pulling out a ladder and with both feet firmly planted on the ground you’ll be much safer in the long run. The length of the blade on the end of the chainsaw is about 10 inches – that’s not long when it comes to chainsaws, but it is adequate for small to medium-sized branches. If you’re concerned about the potential for the chainsaw to become dislodged from the pole, creating a safety hazard, you shouldn’t be. The pole features flip and lock clamps which firmly attach the chainsaw to the pole, making it virtually impossible for this type of thing to happen. You can use this device comfortable in the knowledge that it is as safe as any other chainsaw product on the market. One clear advantage of a shorter blade bar is that it doesn’t have a lot of kickback, making it much easier to control. Since it is an electrical product all you have to do is remove your finger from the trigger when you sense a kickback and the Power will immediately disengage, causing the chain to stop. Overall it’s a very safe design with minimal potential for injury from kickback. This is an electric tool, but it does have a fair bit of power to get the job done. It features an 8 amp motor that will easily cut through most of the branches you’ll find in a typical backyard. You’re not going to chop down any large trees with this chainsaw, but it’s got more than enough power for the average backyard user. Perhaps the best thing about using the pole on this saw is that you don’t need any special tools to do so. As we mentioned above it features a flip and lock clamp configuration and all you need is your two hands to use it. The design is very intuitive and easy to figure out and you’ll be using this tool like a pro after only a couple of tries. 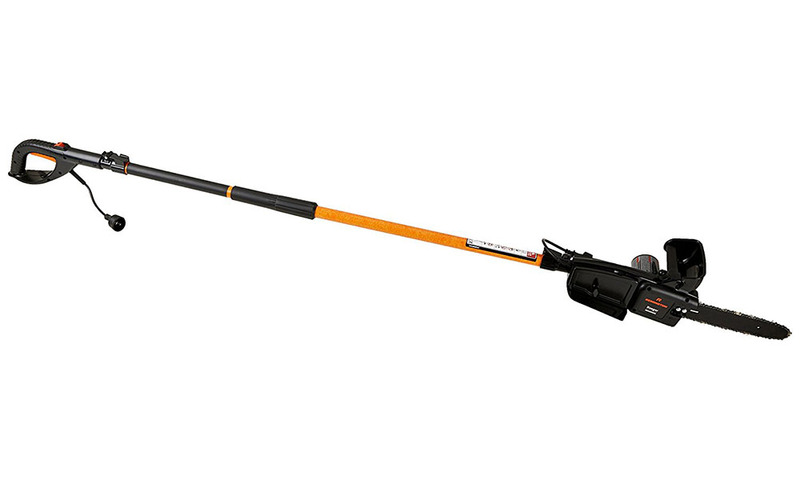 Previously we mentioned that this pole saw can eliminate the need to use a ladder by allowing you to cut branches that are several feet above your head when your feet are still on the ground. It turns out it can reach up to 15 feet, which will actually extend your reach further than most standard stepladders. It’s a very useful attachment that can change the way you use a chainsaw. If you’re worried about losing your grip on the pole while you’re using it you don’t need to be. It has an anti-rotation design that prevents your grip from loosening. Each section of the handle features a rubberized section which provides extra grip and makes it easier to keep your hands firmly planted in place. By most accounts it’s a comfortable design that is easy on the body as well. While I like the innovative design of this product, I’m a little bit concerned by the number and type of critical reviews it has received. Typically, when you read complaints about an outdoor power tool like this it comes down to one or two things. This saw has had many different complaints that are seemingly unrelated. People have expressed concerns with its starting capability and its tendency to leak oil, and they’ve expressed concerns with parts breaking on it. I might be missing a couple of things, but you get the idea. The Remington RM1025SPS Chain Saw/Pole Saw Combo device is a great idea – it’s just too bad that it has received so many various critical reviews. I might be able to overlook one reoccurring issue, but not several. This seems like a saw that it would be best to take a pass on – at least until the manufacturer addresses some of the issues associated with it.